Today we are going to travel to Hout Bay in Cape Town and explore renderings and images of a spectacular house alteration project. Designed by architects Tillmanecke: Architecture, this home makes the absolute most of the surrounding landscape and panoramic views. As we explore it, you'll witness first hand how the interior spaces work in harmony with the exterior spaces as well as how natural light floods the home. The designers have really worked hard to ensure that this home is as stylish as it is functional. 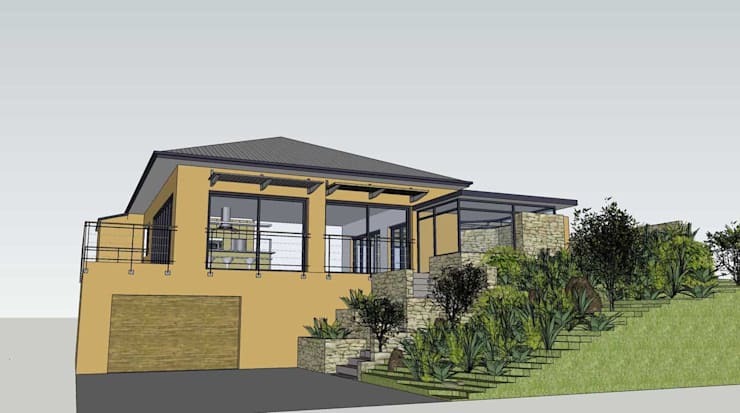 The wonderful thing about these drawings is that they show how you can truly achieve a beautiful home by working hand in hand with your architect. You want to make sure you're both on the same page, which is why drawings like these are really important. 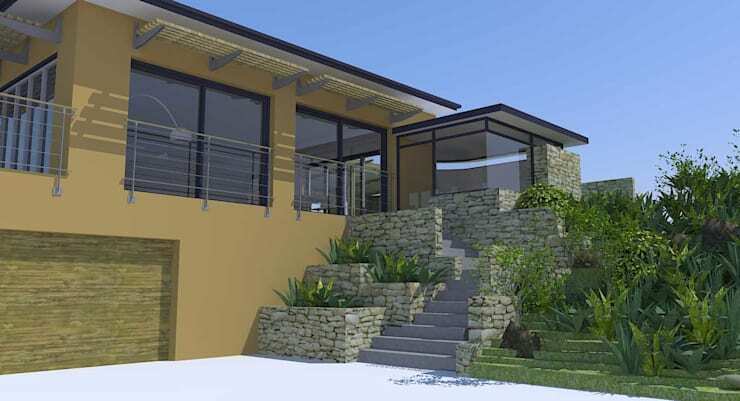 It allows us to imagine what the house will look like before it is complete! In this image, we come across the entrance of the home, which features stairs leading up to the front door. The stairs are flanked by gorgeous stone walls, which add texture and tone to the environment. Beautiful green grass and plants pepper the stone walls, creating an earthy and homely look and feel. The facade features a beautiful mustard colour and holds a functional and stylish double garage. Already we can see how large glass windows and doors ensure that the there is a wonderful connection between exterior and interior spaces. 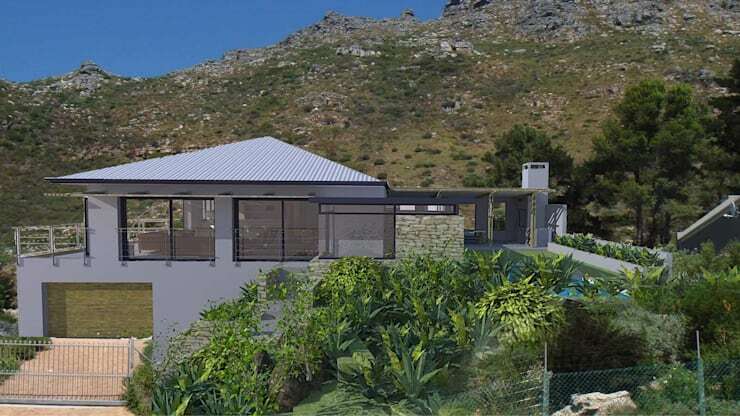 Here we can see how the home is nestled under the mountains in Hout Bay, with panoramic views of the surrounds. The home spreads over two-storeys, with the large glass windows and doors opening the home up to the exterior space. The property is spacious and expansive with a swimming pool and outdoor area. The facade in this image features grey walls. This gives us a chance to see what different colours look like throughout the exterior look and feel. 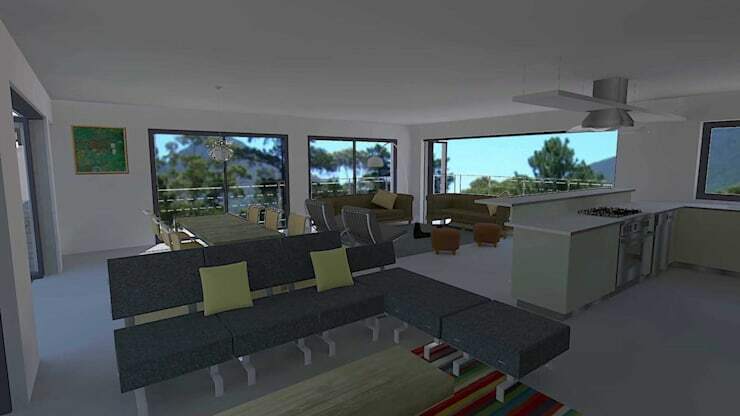 In the dining room and living room we can see how it looks like the room integrates with the mountains outside! The large glass windows and doors open up, creating a seamless transition between indoors and outdoors. 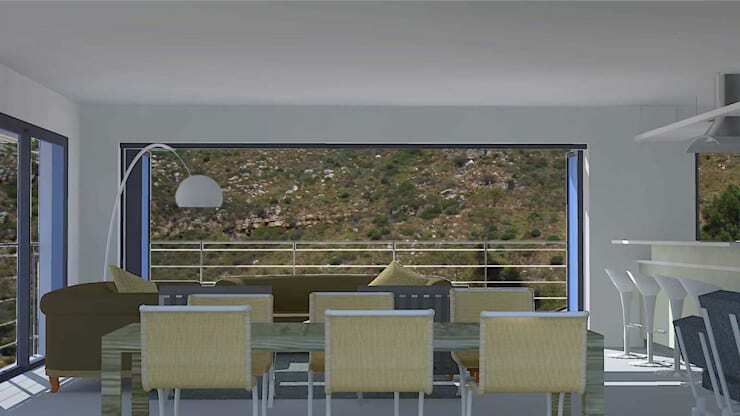 The designers are possibly going for neutral furniture, which creates a very cosy and appealing environment. The home takes on an open plan design, allowing for a seamless flow between areas. It also creates a living area that feels very spacious and expansive. An open plan design is wonderful for a family as it makes for a very interactive space. Members of the family can chat to each other no matter where they are in the house. Don't you love how a balcony is situated around the living space, making it seem that much bigger? Natural light is key to a modern home. Here we can see how it flows into the interior space throughout the day. Opt for skylights and as many glass doors and windows as possible so you can achieve the same look and feel. Here we get a chance to see what the backyard will look like once completed. 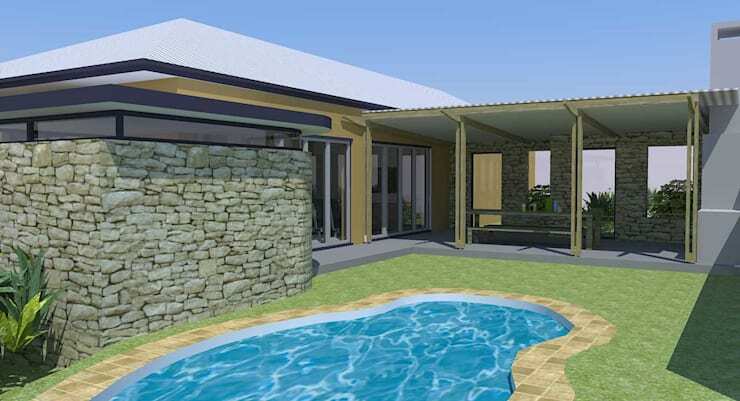 A covered terrace opens up onto a spacious garden and swimming pool area. For a South African family, this is the perfect outdoor space. It is interactive and multi-functional and allows the family to really enjoy the warm summer months. Braai's can be hosted, fun can be had in the swimming pool and the garden can be used for all sorts of games. 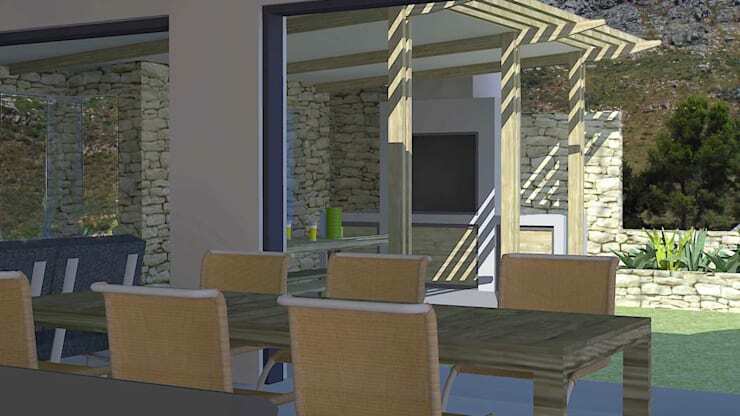 Tip: Opt for a covered terrace that can be utilised in all weather conditions. This sketch gives us a wonderful idea of what the home will look like when its completed, which we've seen in the above renderings. This is a great place to start when you have an idea of what your home will look like. It allows you to really imagine your dream home! It's also incredible how this drawing matches the renderings, showing how fantastic it is to watch a picture materialise in front of your eyes! If you've enjoyed this house, you'll love this chalet-style home that gets rustic decor right. What do you think of this gorgeous home?